How do you store your bikes and bike gear? If you are someone who loves to commute on a bike, go on long bike rides for leisure or exercise, or just clown around with the kids after a long day on your bikes, you know the pain of having to untangle the heap of bike gear every time you want to ride. The perfect solution to this problem is a quality bike rack, but there are so many options that it’s hard to know where to start. We’ve rated the top 10 bike racks on the market today, in all price ranges to fit every budget. Here’s what you need to know about the best bike storage racks. This bike storage rack isn’t just for your bikes. 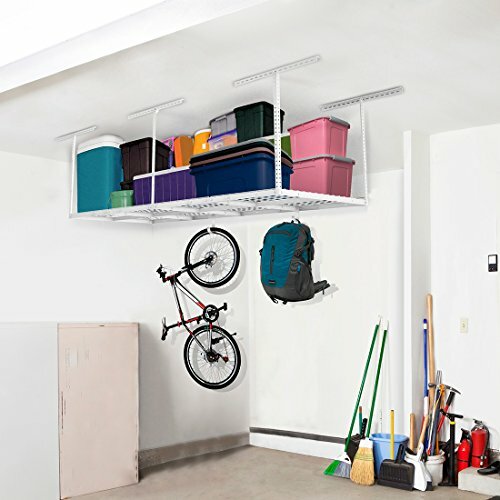 This is an overhead storage solution for a garage, shed, or other utility area, with hooks to hang bikes from the bottom of the overhead storage. This is a fantastic idea for spaces where you just need an all-in-one storage solution for more than just your bike. Put camping gear or seasonal items overhead, and keep your bikes off the floor to avoid water damage or taking up floor space. This storage rack can hold up to 600 pounds, so there’s no need to worry about your heavy-duty mountain bikes staying secure. If you need a long-term solution for bike storage in a shed, garage, laundry room, or some other utilitarian space in your home, the Monkey Bars rack is an excellent solution. This is a rack that can hold six bikes against the wall, very similar to the way they are displayed in a bike retail shop. The coated hooks of this rack won’t damage your bike, and the overall weight limit of the rack is 200 pounds. Made of industrial-grade steel, you can count on this storage rack to stand the test of time, even with regular, daily use. 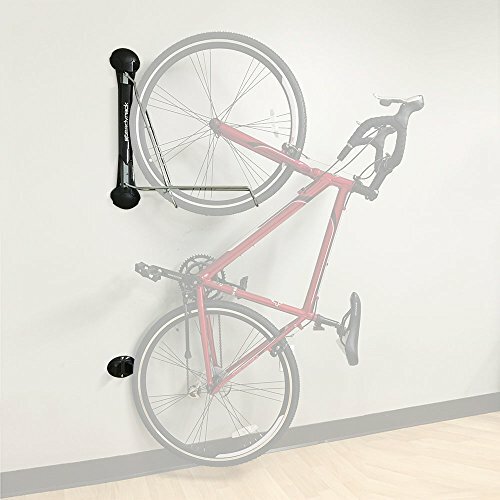 The Steadyrack is a unique hanging bike storage solution that folds up against the wall when not in use. This makes it much easier to tuck into a corner and to get your bike onto the rack without having to go through a twisting, lifting motion that makes hanging a bike a pain. This is a great affordable option if you have a mountain bike and don’t want to spend hundreds on a quality bike storage rack. 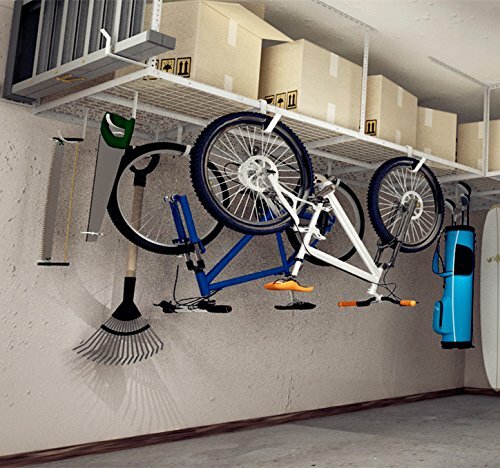 Bikes are hung from the front wheel, so they take up less wall space visually, and can be tucked into a corner or nook. Don’t have the ability to hang a complex storage system on the wall or ceiling? The Gravity Stand by Delta Michelangelo is an excellent alternative. This is a free-standing bike rack, similar to a coat rack, but built to cradle up to 100 pounds total between two to four bikes. It requires just one small hole in the wall to install the stabilizing chain, which is perfect for renters or apartment dwellers. It is made with very sturdy feet so it can be tucked into any area, regardless of the floor covering. It can be used in garages as well as in your living space, so it’s great for those who aren’t in a permanent home yet. 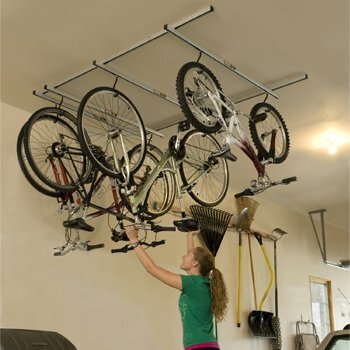 A bike hoist is a unique type of bike storage that makes it easier to get a bike to a high ceiling to get it off the floor. The RAD Cycle Lift Hoist is an aluminum, rust-proof hoist that has rubber-coated hooks to keep your bike safe. 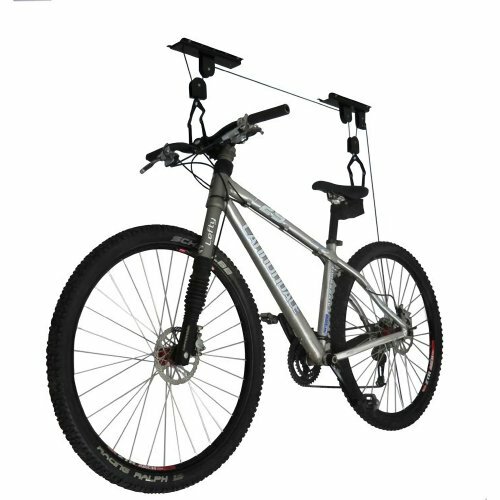 It is rated to hold bikes up to 75 pounds, so you can easily get your mountain bike off the floor as well as a cruiser. It does have a locking mechanism to keep the bike safely stored, and the pulley width can be adjusted so that you can use this storage solution for other outdoor gear, like kayaks, for example. One of the more expensive options we reviewed, the Saris Cycle Glide is a hanging bike rack that is perfect for those who don’t ride their bike every day, or who have multiple bikes that need long-term storage. 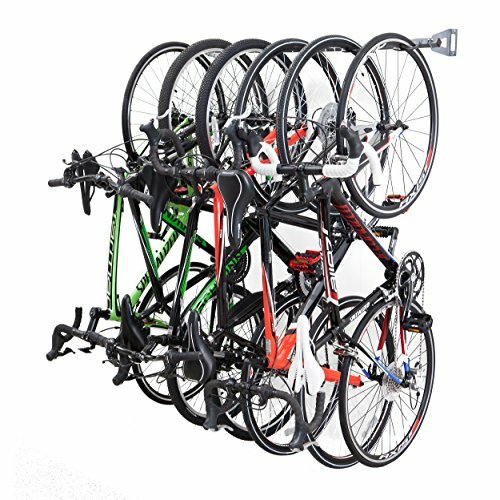 This one holds bikes up to 50 pounds on the ceiling, and while the unit itself is one piece, each bike can be moved independently when stored in the rack. That allows you to remove one bike easily, and all the floor and wall space you free up is well worth the heftier cost if you have very little storage space to work with. This is a unique type of storage system that stores not only your bikes, but also your biking gear. The overhead storage rack will hold helmets, backpacks, and other safety equipment, and underneath the rack, bikes can hang from hooks off the bottom of the storage rack. This is designed for a garage, but it could be installed in a utility area as well. It works great for a small garage where storage space is limited. This is ideal for someone who needs to get some extra storage in the garage and a place to put the bikes all in one. Feedback is an affordable bike rack option for hanging two bikes on a wall. It is adjustable, so you can make it work for nearly any type of bike, from a meaty mountain trail bike to a simple cruiser. These are very lightweight, but surprisingly strong. We saw no issues with hanging heavier bikes on these. 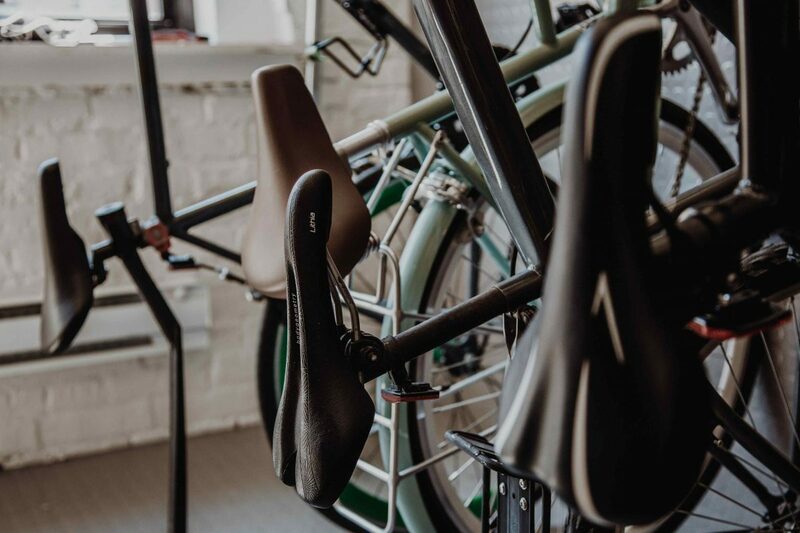 They aren’t exactly the most attractive option on the market, being just basic black hangers on the wall, but they work perfectly in a garage, mud room, or other utility area where style doesn’t matter as much as keeping your bike stored off the ground. Adjustable storage doesn’t get better than the Swagman Hang It. This two-bike storage rack looks similar to a coat rack, with two bike hangers that can be moved up and down the rack. This is perfect for storing an adult bike and a child bike together, or two different types of bikes on the same rack. The pole is secured to both the ceiling and floor via pressure, similar to the way a shower curtain works, so this is likely better in a room like a laundry area, utility area, or garage. You can also anchor it with bolts if you prefer. For some bike owners, having a bike on a bulky rack or on the wall just isn’t an option. 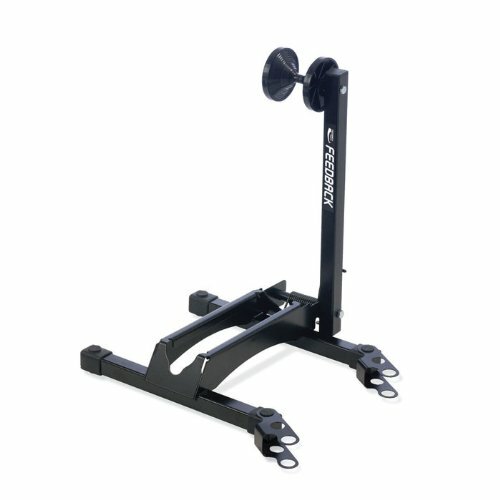 If you just want a basic stand to keep your bike stable in its dedicated space, the Feedback stand is a great option. Affordable and made of high-quality materials, this stand can be easily placed into any space, on any type of floor, and be used with any bike. The adjustable tire cradle means that you can use this stand with a classic daily cruiser or a mountain bike with large tires, so it is great for someone with multiple bikes. With so many great options on the market, how should you choose the right storage option for you? The best way to start is to consider how much space you have for a storage rack. If you are short on floor space, a wall-hanging solution may be for you. Alternatively, if you have plenty of room in your garage and want to organize the space, an all-in-one storage solution may be for you. If you can’t make holes in the walls or have very little wall space, a floor stand is still a solid option for keeping your bike stable when you aren’t using it.